Disclaimer: I don’t generally hold with the notion that there is such a thing as “bad” food, at least not the ones that nature created. As with most things in life, it is the extremes that will get you in trouble. A healthy diet is balanced, both in amounts and types of food, and pays attention to what our bodies require. I also find that the quickest way to make a human being want something is to declare it off-limits. Unless dietary constraints based on health issues prevent you from eating sugar or fat, I don’t think there is anything wrong with indulging in a reasonable portion size of dessert. I love to bake, and I love to share what I bake, and I would have a hard time giving up either. Preparing food and feeding myself and others nurtures me, both body and soul, and that feels very right to me. Okay, I felt the need to say all that first so that I can now quite contradictorily say these Peanut Butter Fudge Bars are BAD. They are so full of fat and sugar that whoever invented the recipe for the King Arthur Flour Baker’s Companion ought to blush. These cookie bars do happen to taste fantastic, in a rich, over-the-top sort of way, but that was not my real motivation for choosing them. 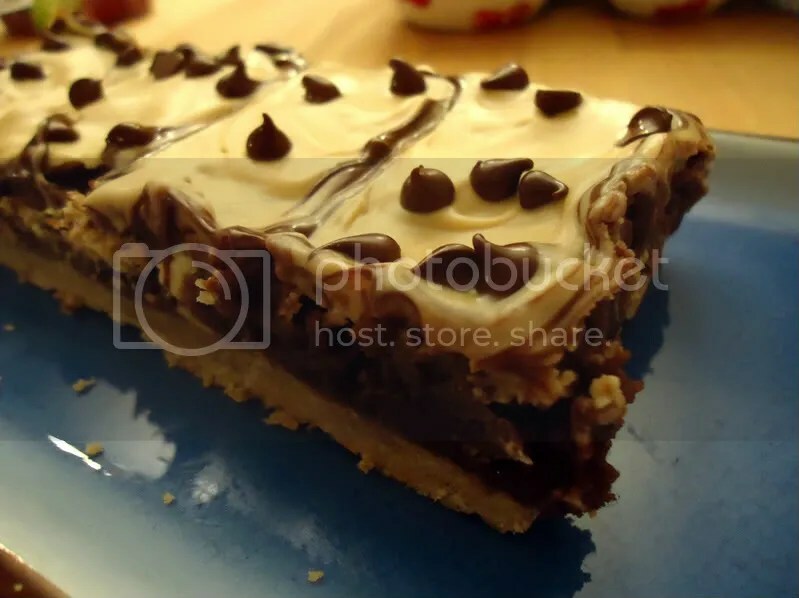 Mainly, I made this recipe because I had two extra kiddos in the house who absolutely love chocolate and peanut butter in all its forms, and I had a surplus of white baking chips left over from the holidays. Oven 350F. First the crust: in medium mixing bowl, beat together butter and peanut butter with electric mixer until soft and creamy. Stir in the sugar, salt, and vanilla until thoroughly combined. Mix in the flour until you have a slightly dry, crumbly dough. Press the dough into a lightly greased 9″x13″ glass baking dish. (It helps to put a sheet of plastic wrap between your hands and the dough.) Bake 8-10 minutes, until lightly brown at the edges. Remove from oven, but leave oven turned on. While the crust is baking, start on the filling. In a medium microwave-safe bowl, microwave the semi-sweet chocolate chips, butter, salt, and golden/corn syrup until chocolate is melted. Stop and stir with a silicone spatula after first minute, and then every 30 seconds afterward to prevent over-cooking. Stir in sugar and flour until mixed, then beat in the eggs one at a time until well-combined. Fold in white chocolate chips, then pour filling on to baked crust and bake for 22-24 minutes. The top will be shiny and set, but don’t overbake — you want to keep a fudgy texture. 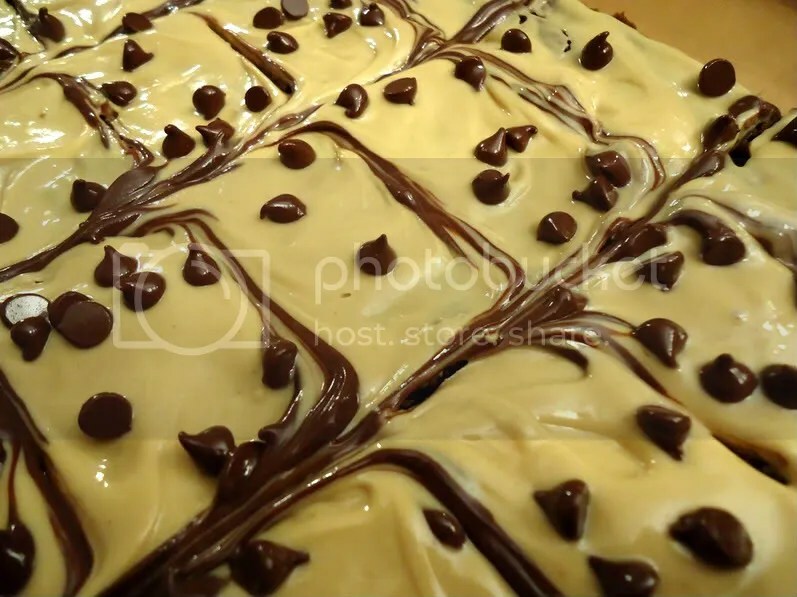 While the bars bake the second time, make the frosting by melting the white chocolate chips in the microwave, then stir in the peanut butter and salt until creamy and smooth. 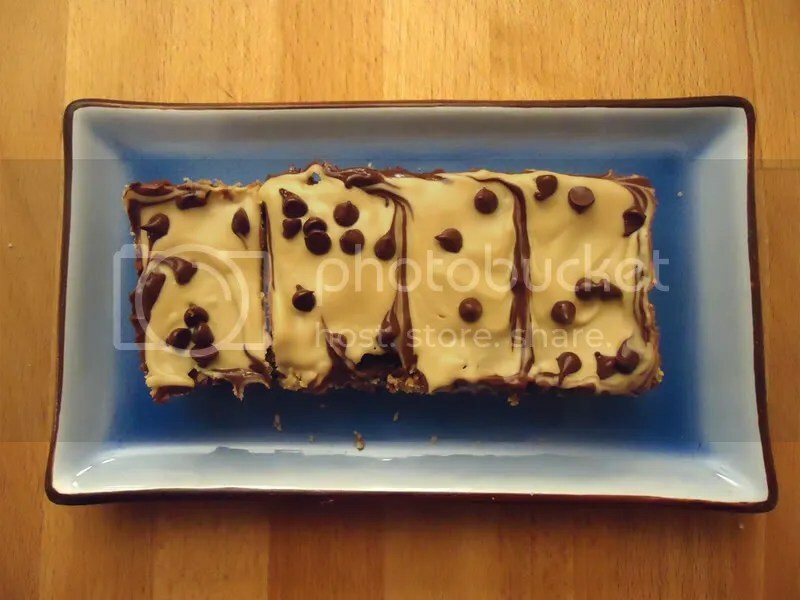 Spread the frosting over the baked, warm cookie bars using a silicone spatula, then sprinkle with mini-chocolate chips if desired. (I mean, really, why hold back now?) Allow bars to cool completely before cutting, then cut into roughly 1-1/2″x2″ bars (six rows both directions).